Enjoy the convenience of an army of radios always ready for work. Using a Bank Charger, it’s easy to maintain the battery power of your fleet of radios. The great thing about these chargers is the option of rotating batteries through by themselves. When you have radios that are nearly always in use, having a few extra batteries in the rotation will go a long way to keeping all your radios fully charged. Batteries can be charged with the radios or separately. 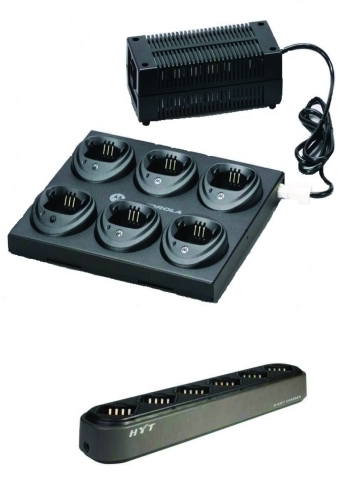 Perfect for portable use at event site without having need for multiple single chargers with separate electrical cords. You can charge the batteries while attached or separated from the two way radios. There is no danger in allowing the battery to be charged past 100% as it switches to trickle-charge which protects battery from over charging. Flashing "red" could also mean that battery it not making proper contact and flashing "yellow/orange" may indicate that charger is receiving improper voltage. 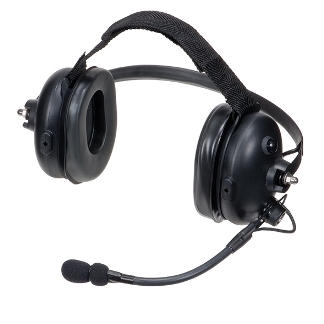 Designed for high-noise environments, this heavy duty, dual-ear push-to-talk headset with swivel noise cancelling boom microphone; noise reduction rating=24dB. Headset can be worn with or without a hardhat. The push-to-talk switch is located on the ear-cup. Designed for rugged use in high noise environments where hearing protection is required. Headsets include a flexible noise-canceling boom mic. Models vary based on availability therefore individual specs are not posted online, as a result: images on website may differ from actual equipment shipped although not materially different. We only use OEM or Quality third party accessories as it’s of highest importance they meet with your satisfaction. Headset plugs into radio (many radios have silicon cover which lifts to unveil jack). Be careful as you walk grounds indoor or outdoor as you may not hear vehicles or what surrounds you. Make sure to turn ON radio prior to connecting speaker mic (if you do not it may force broadcast which means other radios on same channel will be in use as if you were pressing the push-to-talk button). Designed for moderate-noise environments, this light weight headset lets users enjoy communication that’s clear, private and hands-free. 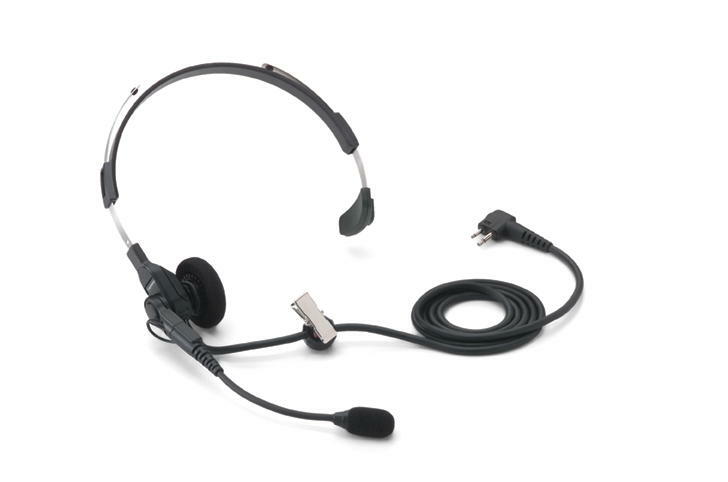 This lightweight, single-ear headset is comfortable for extended wear and has a swivel boom microphone. No adapters required. Works well for light-duty use mainly indoors or with weather is not a factor. Headsets include a flexible noise-canceling boom mic. Headset plugs into radio (many radios have silicon cover which lifts to unveil jack). Can be used on either ear. Boom style swing microphone is flexible and can be moved into comfortable position. Press push-to-talk button on radio to speak when using headset. Make sure to turn ON radio prior to connecting speaker mic (if you do not it may force broadcast which means other radios on same channel will be in use as if you were pressing the push-to-talk button). Designed for moderate-noise and discrete environments, this accessory lets users enjoy communication that’s clear, private and hands-free. For use in the left or right ear. 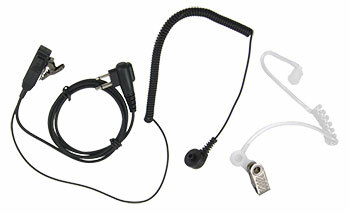 Features a straight wire from the radio to the Push-to-Talk switch and built in microphone, then a thin coiled wire to the clothing clip, where the clear acoustic cord attaches. This is type of headset you will see worn on CIA field agents. Headset plugs into radio (many radios have silicon cover which lifts to unveil jack). Can be used on either ear. The two cords are usually beneath outerwear shirt/sweater/jacket as they connect from radio at belt area up to ear and upper body for mic/push-to-talk button. Make sure to turn ON radio prior to connecting headset (if you do not it may force broadcast which means other radios on same channel will be in use as if you were pressing the push-to- talk button). This compact microphone has a revolutionary windporting feature that helps lessen background noise from high winds and other severe weather conditions. Audio can pass through the speaker grill even when the microphone port is blocked by water. 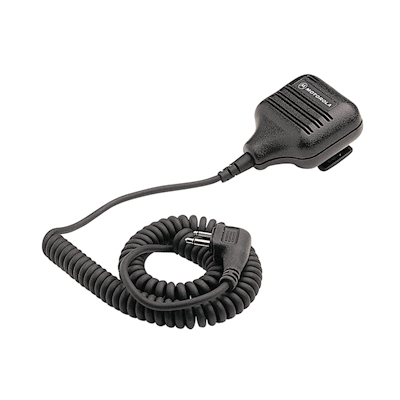 The coiled cord allows talking and listening without removal from belt or case. Includes Push-to-talk switch, swivel clip and quick disconnect latch. Works well in moderately noisy environment where it may be difficult to hear with radio alone as the speaker mic can be clipped to the shirt/uniform near your mouth and ears. Speaker mic plugs into radio (many radios have silicon cover which lifts to unveil jack). Press push-to-talk button while speaking and let go to listen. Recommended location to clip speaker would be on upper body/shoulder area while leaving radio attached to belt. Placing speaker in this location will improve ability to hear incoming communications. Keep in mind that this can get loud (based on radio volume setting) and is not private.